Spinal Tumour. 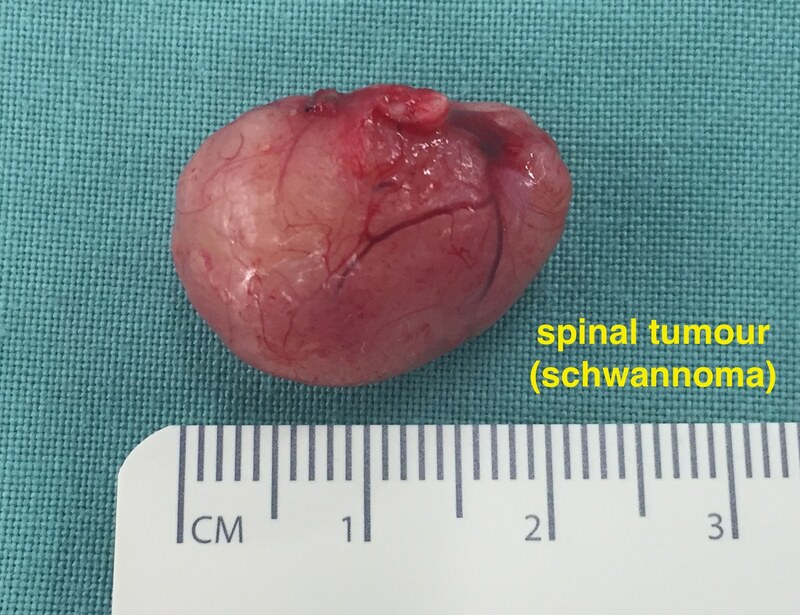 This is a tumour (schwannoma) after removal at surgery. The spine, spinal cord and spinal nerves can be affected by several different types of tumours. Surgery for spinal cord tumours is a specialised area of surgery and Dr Ball has expertise in the management of these conditions. The spinal cord and nerves are contained in a sac made of a tissue called dura. Intradural spinal cord tumours grow within this dural sac, in or around the spinal cord and nerves. These spinal cord tumours can grow outside the spinal cord (extramedullary) or inside the spinal cord (intramedullary). meningioma : this tumour grows from cells in the dura and expands towards the spinal cord and nerves. They are mostly slow growing, benign (non-cancerous) tumours. 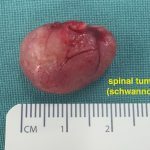 schwannoma : this tumour grows from cells in the spinal nerves (Schwann cells). They are often attached to a spinal nerve. They are mostly slow growing, benign (non-cancerous) tumours. Other types of intradural extramedullary spinal tumours include neurofibromas, haemangiomas and metastases (cancer spread). Other conditions may mimic tumours, such as arachnoid, epidermoid and dermoid cysts. Some tumours can be observed. Those causing significant symptoms or spinal cord/nerve compression may require surgery. Extramedullary Spinal Cord Tumour. This image demonstrates a large tumour (meningioma) pushing on the spinal cord. ependymoma : this tumour grows from ependymal cells lining the central canal of the spinal cord. astrocytomas : this tumour grows from astrocytic cells that support the nerve cells of the spinal cord. Other types of intradural intramedullary spinal tumours include cavernomas, haemangioblastomas and metastases (cancer spread). Some tumours can be observed. Those growing rapidly or causing significant spinal cord symptoms may require surgery. Intramedullary Spinal Cord Tumour. This image demonstrates a tumour (haemangioblastoma) growing in the spinal cord and extending out the surface. laminectomy : removal of bone from back of spine. durotomy : opening of dura to get access to spinal cord. removal of spinal tumour : technique varies according to type of spinal tumour. dural closure : sewing dura back together. wound closure : muscles, tissues and skin sewed back together. Click here. Warning – these include graphic imagery of surgical procedures.